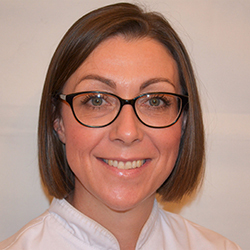 Podiatrist Tammy Button qualified from the Birmingham School of Podiatry in 2006 with a First-Class BSc Honours Degree in Podiatry and until January 2017 Tammy worked in NHS Podiatry as a Diabetes Specialist Podiatrist. Tammy offers all forms of Podiatry and Chiropody, including routine toenail and foot care, corns / callus and verruca treatments, diabetic foot care, biomechanical assessment of the foot and lower-limb musculoskeletal management, leading to the prescription of orthotics / insoles and rehabilitation from injury programmes, nail surgery for painful nail conditions and is licenced to administer local anaesthetic. Tammy is a keen cyclist, Mum of 2 daughters and alongside her clinical work, teaches year 3 Podiatry Students Clinical Studies at the Birmingham School of Podiatry. During your first assessment, information will be taken regarding your medical history and presenting complaint. A thorough vascular assessment will be undertaken to assess your circulation along with a neurological assessment to assess nerve sensation within the foot and motor function that could affect normal gait. 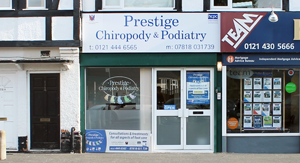 Any treatment will be undertaken which may include advice regarding footwear and general foot care to keep you as pain free and mobile as possible. We are able to liase with your G.P. if necessary regarding any conditions you may have and we are also stockists of numerous footcare aids and products.